The United States is the longest-surviving constitutional republic with the oldest written constitution in the world. Its government operates as a representative democracy through a congressional system under a set of powers specified by its Constitution. There are three levels of government: federal, state, and local. Official’s at all three levels are either elected by voters in a secret ballot or appointed by other elected officials. It is a constitutional federal republic nation on North America continent consisting of fifty states and a federal district. After the fragmentation of American’s colonies with its mother country in 1776, USA was recognized as a new nation. 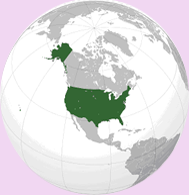 During the 19th and 20th centuries, 37 new states were added to the original 13 states and it has expanded across the North America and other overseas possessions. USA is one of the biggest countries in the world coming second only to Russia and Canada, Surrounded by the North Atlantic Ocean to the east, the North Pacific Ocean to the west, and Mexico to the south, and Canada to the north. USA is hugely diverse owing to its huge geographical area, it has 50 states in all for a better understanding it is split in six different regions. They are the Northeast which is known for its colleges and universities and winter there is cold and snowy summers are hot. Then there is Middle Atlantic includes places like New york, New Jersey, Washington DC, this region is home for one of the biggest cities in the world. This is region is known as the corporate centre of the world. The South consists of people known for their hospitability and the weather there is mild, includes places like Texas, Virginia , Kentucky etc. Midwest is known for its farmlands and is also known for having old traditions and cultures, includes places like Ohio , Michigan, Wisconsin. Southwest is home mostly to immigrants and outsiders. The west this is where the new pop cultures spring , known for its open mindedness and less traditional behavior this is one of the most culturally diverse region.